BIG Brendan Morris was proud to join the queue of Reading Roadrunners proclaiming their shiny new Easter personal bests. But Brendan was barely telling half the story. What he failed to mention was that he actually WON the race, beating a field of over 700. While some of London’s elite runners were in Berkshire on Good Friday denying our best guys the prizes at the Maidenhead 10, our gentle giant was already in the capital to gain revenge. So a month which began with a lot of frustration ended in triumph and Brendan can look forward to the Virgin London Marathon with bags of confidence. “I’m hoping to improve on my marathon time of 2:41 that I ran at Abingdon last year, which has got me on to the Championship start line for London,” he said. “If my taper goes smoothly and there are good conditions on the day I’ll be aiming to go under 2:40. “My wife Gemma will be running London as well as she got through in the ballot. She’s new to running but has been putting in a tremendous effort and deserves to achieve a time she should be proud of. “Though I won’t be with her on the day, my thoughts and some of my concentration will be with her. My wife and I both wanted to do a half marathon as part of our training and we picked the Bath Half as we knew it was quite a flat course. Unfortunately the ‘Beast from the East’ had other ideas and the event was cancelled due to heavy snow. Not long afterwards Gemma Morris suffered a foot injury and eased off the mileage, but Brendan was still keen to race a half marathon and to crack the 75-minute barrier. 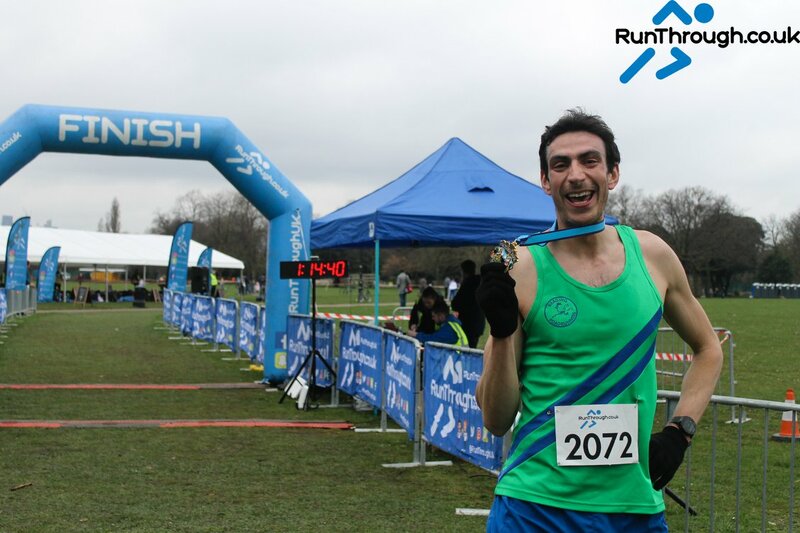 Using the RunBritain website he sourced the Victoria Park Half in Mile End, east London. Well, not really solo! The six-and-a-half lap course soon became a parkrun-style free-for-all. Not only was their route open to the general public enjoying a dry Bank Holiday but two more races, at 5k and 10k, were taking places simultaneously over the same course. “It was a constant battle to pick a racing line against oncoming dog walkers and runners who I was lapping,” said Brendan. But he was always up with the leaders and his 75-minute pace target. By the nine-mile mark he was pulling away from his main opponent, Tom Sawyer of Tring. He eventually prevailed with 35 seconds to spare over second-placed Sawyer. “Crossing the line I was over the moon,” he said. “I couldn’t quite believe that I had cracked it. “But I’m always looking to improve, so I never dwell on the PBs too long before trying to work out how I’m going to cut the time down further. Roadrunners men’s captain Phil Reay paid tribute to the achievement. “I’m thrilled for Brendan that his hard work and dedication has been rewarded with a race win,” he said. “After recording PBs at seven distances in 2017 it’s no surprise to see him continue to go from strength to strength. If he does, let’s try to persuade him not to make a secret of his future successes.